Do You Know how to Use LinkedIn Today’s new “Channels”? I had to find out all the new features so here is what I found out. 1) There are twenty one channels to choose from to receive your news – Business travel to Job Search. 2) There is Your news which allows you to select which news source you get your news from – NY Times, Business Week, INC. ETC. Are You Using LinkedIn’s “LinkedIn Today” News features? 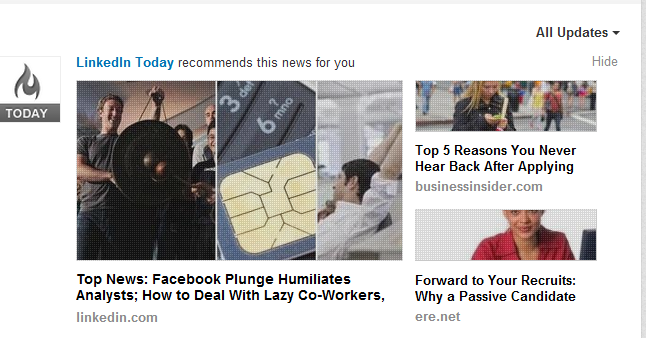 your mouse over the words “LinkedIn Today” and click on the link. enables you to customize your news feed. connections would be interested in or focus on your expertise its best to select three or four for the best results. eighty nine sources to choose from. Pick as many as you want you can always add more later. weekly, or no emails. No emails means you have to check in to your LinkedIn account daily to check up on the news.